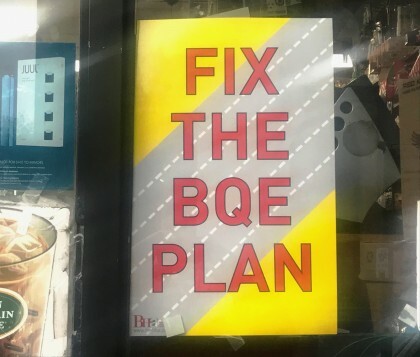 The BHA has retained engineering consultants to evaluate alternatives to DOT’s plan and assess ways to reduce traffic on the BQE during the construction period. Their expertise will greatly assist the BHA in showing DOT that viable alternatives exist and warrant its consideration. pave the way for passage of a long-delayed congestion pricing plan that would place tolls on the East River crossings. This measure would reduce traffic on the BQE, making alternative construction approaches more feasible and mitigating their environmental impacts. With this new political opportunity, the BHA will advocate for the passage of this congestion pricing plan. Posters (photo) and buttons are available for free at the Brooklyn Women’s Exchange, 55 Pierrepont Street, and at the Montague Key Food. To help finance the BHA’s efforts to save the Promenade, you may donate to their BQE Fund here. You don’t have to be a BHA member to contribute. Great to read this. The shifting political sands could indeed help with finally getting congestion pricing passed. It was mostly Republicans in the suburbs who opposed it before. It seems everything with you is Democrat versus Republican on select topics. Just stating the facts, sir. Are you thinking they are…alternative facts? On election day morning I was at the Clark Street station and I believe Brian Kavanagh (NY State dem. Sen) was there campaigning, and I believe I heard him talking to someone, supporting the temporary highway plan. I was in a bit of a rush so I didn’t hear the whole convo but I was disappointed. Not sure who the buck ends with on this issue though, and who we really need to convince, ultimately. Interesting that a group that prominently proclaimed, ‘We need design-build approval from the state because time is of the essence,’ now says, ‘We can wait for Albany to pass a law on congestion pricing,’ which is hardly a done deal regardless of who controls the state senate. Sure hope BHA has better luck this time then they did with the View and Pier 6. I spent 10 minutes talking to Kavanagh that morning. I pressed him on his position on the BQE repair plans. My takeaway is that if he doesn’t hear a better idea, he is prepared to support the so called innovative approach. This is an uphill battle that is going to require some real effort to Save the Promenade. Looks to me like Kavanagh is avoiding any mention of the BQE repair issue on his website. No matter what plan is selected the Promenade will need to be replaced. Unless the tunnel idea is resurrected, but no one is pushing it. I’m sure DOT’s engineers view replacement as a necessity. They are working from the premise that the innovative approach is the way to go. I’d prefer to have engineering opinion from independent engineers without a dog in the fight. The Promenade has been neglected for quite some time. On the the surface this neglect is quite obvious but not sure it requires replacement of the entire structure. I’m all for the 21st century concept of a tunnel. Unfortunately Kavanagh as well as Jo Anne Simon, who was also in on the conversation, both seem convinced that tunneling is beyond the city’s capabilities. A tunnel IS beyond NYC’s resources. A route through Brooklyn Bridge Park IS viable – and almost surely less costly! The BHA needs to throw its weight behind “a contender” – and do it before a disaster. Congestion pricing is probably a great idea … and will have – MAYBE – some impact. But it bumps into the reality that most employers DO NOT SAY to their workforce, “When would YOU like to come to work?” This is not “Black Friday” bargain hunting, where you alter your schedule because there’s an incentive to do so. Other commenters point out that our “electeds” are treading water because this is like post-Sandy – you can’t DO NOTHING – and the BHA’s “we’re going to engage some consultants to come up with something” IS just that – a big fat nothing-burger! The Promenade’s surface was rebuilt several years ago, with new drains—which quickly clogged because of soil and other blockages—and slate and other surfacing. Are you a member? I am. Do you have any facts to base your statements on? Or are you just trolling us? Why is BBP considered “free game” to the members of the BHA? Is it due to the “rowdy basketball kids that use it”? Is it the fact that the BHA leadership skews 60+ and has no need for roller rinks, soccer fields and playgrounds? Any way you slice it the “park plan” smells elitist and NIMBY beyond belief. Expect massive blowback from the communities that use the park. Not a good PR plan. Pitting groups against each other is a recipe for failure . . . I think this is a fair argument to make, although I’m a bit more reluctant to ascribe selfish motive where failure to consider the implications of unintended consequences may actually, merely, exist. I suppose it can’t hurt for proponents of routing the BQE through the park to examine that idea for all its hidden linings and messages. The engineering report on the existing condition of the cantilever structure was conducted by an independent firm, not the DOT. But this is using “NIMBY” as a liberal dog whistle. Somebody (actually many thousands of somebodies) will be affected adversely by this necessary work – whatever path is chosen. I submit that we should look to do the least harm (to all) as possible – as tough as it is to determine that – until/unless the cost gets prohibitively large. But mostly, arguments like the one voiced here come from people who are ignorant and/or mis-informed. BBP is WIDE at many points – including the basketball courts – they are built OUT over what is essentially RIVER – so that we’re talking about co-existence, not displacement! … In contrast to 100% displacement probably for close to 10 years for the DOT plan – i.e., X the Promenade; and REPLACE IT with 6 lanes of often crazy heavy traffic. Sometimes, it’s hard to divine which is “the lesser of 2 evils.” This is NOT such a case, and to pit a Columbia Hts 1 percenter against a kid from East NY is beneath contempt, so transparent is the toxic intent and so far from reality! I don’t disagree, and I hope you noticed that I worded my comment very meaningfully differently from the one I was responding to. My overarching point is that there will be unintended consequences of either solution, and we owe it to ourselves as citizens to consider these; perhaps some can be mitigated. And I do think it’s valid that there is a small, very vocal group of our community that are fervently anti-park (and pro-insularity), for whom the idea of routing the BQE through the park would come in the hopes of deterring visitors, whether they’d be willing to admit it or not. Routing the BQE through where the berms are is not anti-park. No one uses the berm areas for any activities. And this would be temporary, anyway. Once can be anti-BBP because of the amount of pedestrian traffic it brings to Joralemon Street and Willowtown, without being against the park itself. The BBP management has consistently failed to address the impact of literally millions of visitors on BH. BBP is not in a vacuum, or adjacent to an industrial wasteland. ^^^ News Flash! There is no “Over the park” Solution. No such workable plan has yet been presented by anyone. My informed, educated opinion is there will never be such an option either. Y’all need to focus on realistic alternatives that already exist, like the tunnel. Ultimately, unfortunately, this makes sense to me, unless the highway goes elevated and winds west around buildings or something. Either way it starts to look less and less temporary…and that’s the main issue I have with the proposals we’ve seen, both the DOT’s and the alternatives: things that are supposed to be temporary end up sticking around way too long, such as the scaffolding outside St. Ann’s Church. Arch, the tunnel sounds great too but where does the funding come from and how do you respond to the suggestion that it would take much longer to build the tunnel than it would to rehab the cantilever? And Andrew, I am not saying that all people who are concerned about pedestrian traffic are anti-park, I’m saying that some of the people who are anti-pedestrian traffic are actually pro-insularity and cherry-pick the pedestrian traffic issue and relatively few incidents of crime in the park as a dogwhistle, one that those who suggest doing anything that might deter use of the park ought to at least bear in mind when making their argument. You are a voice of sanity, someone who doesn’t just post (a la a.p.) to “hear himself type” or someone who – Trump-like – picks the facts that he likes and makes up some when it suits him. Talk about a non-starter – where advocating it makes MUCH MORE LIKELY a “temporary” fix “at Heights street level” – that’s the not-since-the-Pyramids tunnel idea! Not sure if Boston would do what it did again, but until/unless we dramatically alter NY’s tax code or a Dem “who owes NY” (KG??) is in the White House, a tunnel fails the “Oh yeah, Cuomo and Buffalo love NYC like you wouldn’t believe!” test. If you look at a map or – better, of course – walk the terrain, you see that a route that nibbles at BBP and “goes through” the now empty northernmost EMPTY “Witness” building is eminently practical. As “Studio” said, simply & elegantly, there WILL be winners & losers here (and unintended consequences), but inconveniencing dog walkers – yup, a big downside to my plan – is as laughable as the NIMBY argument is evil. And who wouldn’t love a solution – “mine” – that involves building in LESS populated space and not 300 feet above sea level, one of which makes the work likely to happen sooner … and the other takes a giant bite out of the cost! Getting back to the skimpy “news story” Mr. Scales snipped, for the BHA to “parlay” when they have nothing to advocate just gives DOT the chance to say, “But we DID involve the community” down the road, when maybe a proposal like mine would have the requisite drawings & studies backing it up and be harder to dismiss. Again, you can’t beat something with nothing! You’d think the BHA was at least THAT smart, although that’s a tough call, given its track record on Heights preservation and quality of life the last 5-10 years. Yes, every alternative will have winners & losers & unintended consequences, besides. But the DOT proposal is one that only Robert Moses would love. The tunnel idea is the absolute epitome of “non-starter.” IF!! NYC had a friend as NYS Governor or as POTUS (and we’d probably need a Dem. Senate to boot), there’d be a glimmer of hope on that front. In that we’re looking more than 4 years out on EITHER, it’s time to get serious … or DOT’s proposal will win by default. Permanence is not a danger, because the park DOES have a surprising amount of power & support – much like the High Line, in fact. Remember, we’re talking “nibbling at the Park” vs. scarfing down the Promenade for 10 years, give or take. “Permanence” also is made all but impossible because [this much is certain!] having spent $1-5 Billion working on the existing BQE, politics AND common sense AND motorist convenience mandate that my proposed interim arrangement is just that! I simply hope the BHA will rule out the impossible and throw whatever expertise & clout it has behind the only alternative that has a fighting chance. And there you have it. Park doesn’t matter (even though used by a much broader swath of New Yorkers for much more than a scenic tourist stroll) and Pierhouse/1BBP families certainly don’t matter because, well, they deserve to be punished for taking away part of our view. Silly POV based on a solution that will never happen as Park Advocates will engage every single group using the park from every corner of the city to defend it. And don’t think for a second that both groups won’t be lawyering up soon. Honest, I L-O-V-E the park, but people SHOULD come first. Most of the park – its best and most used parts – would be spared entirely. Yup, some dog walkers can and will present their petitions, but for both political AND “equity” reasons – as in what is least un-fair?! – there’s no comparing the 2 for viability. A tweak or 2 to a 10-year-old park … vs. livability in large parts of a vibrant 250-year-old community – get serious!! Add back in the time & $ savings, and this is as close to a no-brainer as I’ve ever seen re construction alternatives. You are the epitome of an uninformed blowhard. The tunnel plan was already “started” and determined as feasible by the DOT. If you spent half a much time doing some basic research as you spend cranking out reams of drivel, you might actually understand whats going on.